Cedar Falls swim area, Tamborine Mountain, Hinterlands, Queensland Australia. 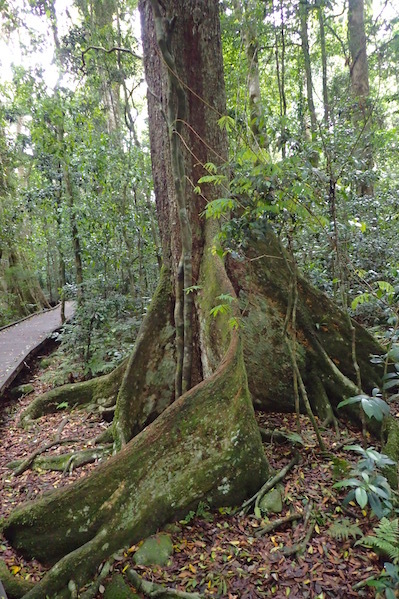 Mount Tamborine, Hinterlands, QLD, Australia. What would you expect from a couple of cruisers anchored for free on the Gold Coast section derisively known as "Bum's Bay," but to escape the cityscape in search of free stuff to do? Who then were we to resist checking out the real place referred to as Australia's Hinterlands? Chris and Chris of Scintilla, who we wandered Fraser Island with, were of like mind.... And car rentals cost half as much when you split the fee. We got off to a better-than-expected start in our pursuit of frugal fun. 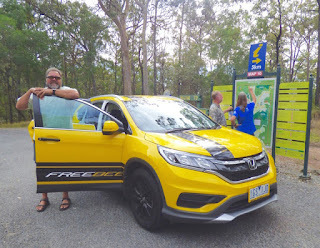 We were willing to pay the few extra bucks to rent a car from East Coast Car Rentals because unlike other Gold Coast car rental companies, they were willing to pick us up for the rental and drop us off after its return. 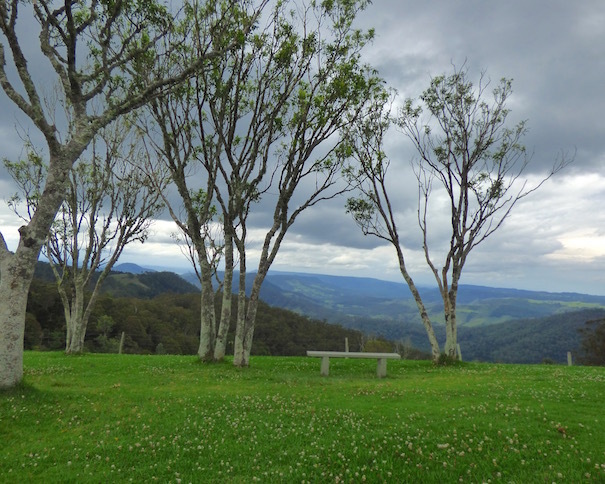 Lookout just outside Green Mountain portion of Hinterland's Lamington National Park. QLD, Australia. Our lucky day - the manager asked if we posted on Facebook ("Yes! And I do a travel blog!" I offered up) and gave us a FeeBee. Free. Their bumblebee billboard on wheels, which was a pretty sweet deal. They even threw in the insurance - all we paid was to replenish the fuel we used driving. The tricky bit about exploring the Hinterlands is that if you want to check out several places, you'll quickly find there are no shortcuts. The area is mountainous, and the roads through the Hinterlands are more like fingers joined only at the palm. Thus, if time is limited, despite the see-it-in-a-day driving guide, you'll find need to narrow down what you want to see. 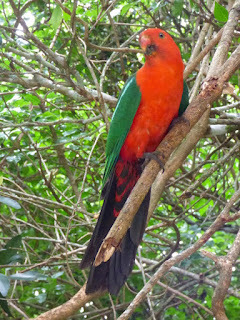 We settled on O'Reilly's TreeTop walk first, in the Green Mountain portion of Lamington National Park*. By the time we arrived, after a brief break for a bite, and a turnoff for a lookout point just outside the park, it was late morning. *Lamington Park is a collection of sites, and yet another Unesco World Heritage site, part of Gonwanda Rainforests of Australia. 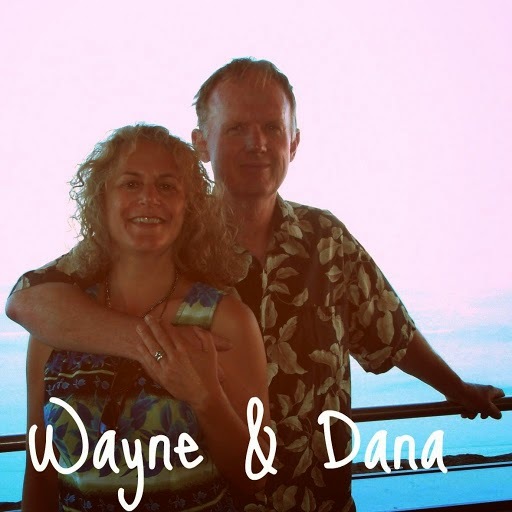 Wayne and his bird buddy. Lamington National Park, Hinterlands, QLD, Australia. Bird in tree. O'Reilly's, Hinterlands, Oz. 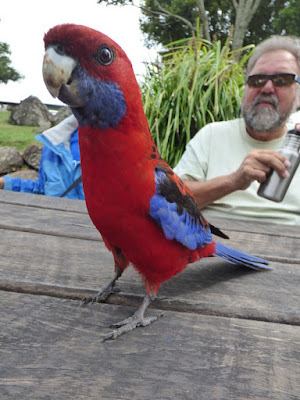 Serendipitously, we'd arrived during bird feeding time. We got a kick out of watching oodles of colorful parroty birds eat and land on visitors heads, arms, and shoulders. 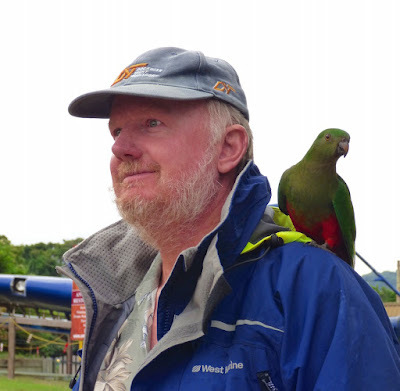 After one bird settled on Wayne's shoulder, he tried to woo one atop his head, placing bird seed there. No luck. Seems a bird on the shoulder is better than none one head. More fortunately, the bird left no "calling card" behind. And as much as we got a kick out of the little boy who happily encouraged the birds to land on his bare arms, we also hope he did a good job making sure if he got any cuts, he disinfected them well. We noticed he did get some scrapes and understand the birds carry a lot of infection that can cause issues. 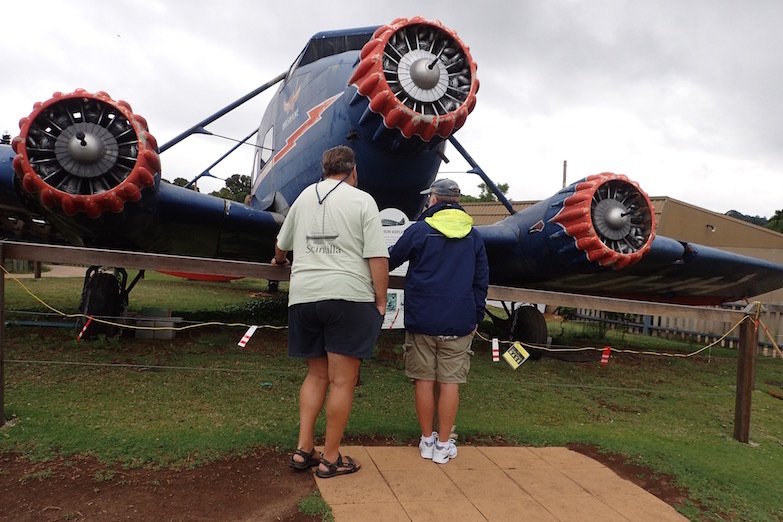 Chris and Wayne checking out the handsome full-sized Stinson plane replica at O'Reilly's, Lamington National Park, QLD, Oz. We also checked out O'Reilly's an impressive full-sized Stinson plane replica, in honor of a family member who rescued two plane crash survivors. The original plane, which crashed in the area, was missing for 10 days before Bernard O'Reilly found it. 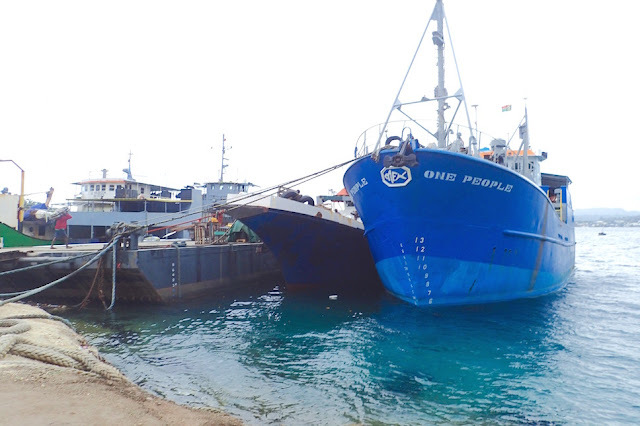 Once he did, he returned the next morning with a doctor to treat and transport the remaining survivors for recovery. Five didn't survive; four died on impact, and one due to exposure during his attempt to seek help for the other two. 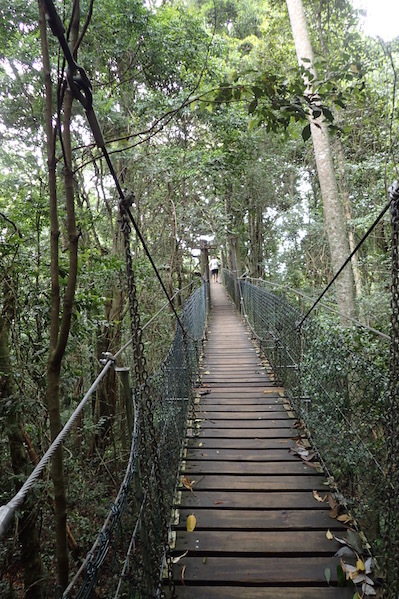 Just a stone's throw from the bird feeding area, the Booyang Walk, which leads to the TreeTop walk was easily visible. 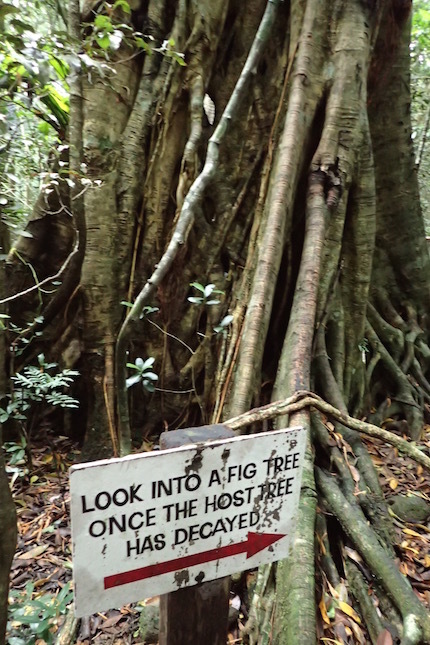 Placards describe the unique subtropical birds and trees. There's a strong sense of other worldliness amidst these ancient giants, further enhanced by the day's gray skies. 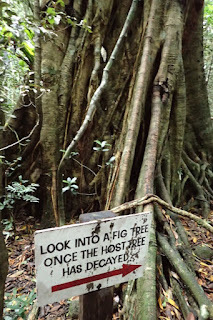 It's east to imagine being alternately enchanted or haunted by creatures amidst the mists of this ancient forest. 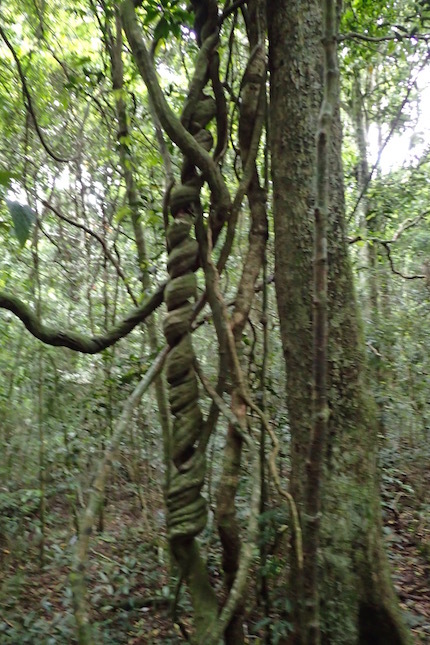 Wonga vine, assertively twisting its way to the sunlight. Lamington Natl. Park, QLD, Australia. 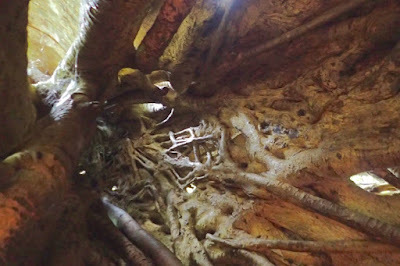 At the same time, it's a nature's playground for all ages.... Squat down and climb inside the cave-like inside of a bygone giant stranger fig and look up at the sunlight seeping through openings in the trunk. Determine your level of acrophobia as you sway your way across the high, tree-top suspension bridges. 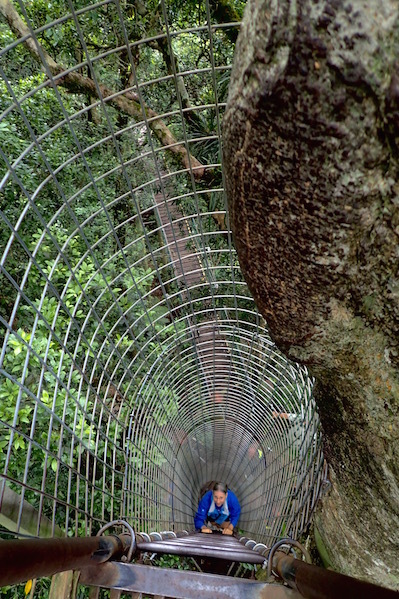 Or again, along with testing your sense of claustrophobia as you shimmy up the cage-enclosed metal ladder to check out the tree-top lookout. Lamington Natl. Park. QLD, Australia's Hinterlands. Alas, due to the overcast, and "can't see the forest for the trees," the treetop lookout view was not that outstanding, though oddly worth it simply for the experience. It harkened back fond childhood memories of the tall treehouse my Dad built in our Sacramento, California backyard, amidst the ancient oaks, peering out over the meadows beyond our fence line. Chris scales the treetop lookout ladder. Lamington Natl. Park, QLD's Hinterlands in Australia. Chris, one one of several suspension bridges, O'Reilly's Tree Top trail. Lamington Natl. Park, QLD, Hinterlands, Oz. Beyond the Booyang Walk, we followed the signs to the Mountain Garden. We hadn't heard about it in our prior research. A volunteer supported orchid garden, we wandered its twisty paths, enjoying its variety of flowers, and its magnificent ferns. The biggest treat was the mama skink, tending to her babies, speckled like fawns. 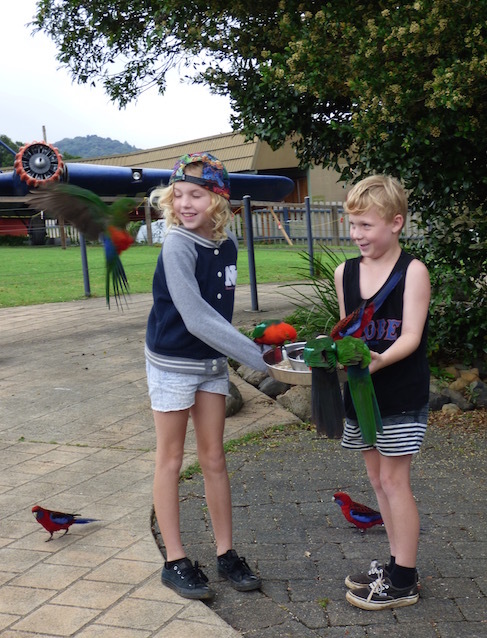 The same kids we enjoyed feeding the birds quietly pointed us to them. After a picnic lunch which drove home the point the birds don't read the park's "Don't feed the birds" sign, we figured we had just a few more hours of daylight left before we wanted to be off Hinterland's narrow, twisty roads. We figured we could slip in a short hike at Mt. Tamborine Park,and headed that way. What trip to the Hinterlands would be complete without seeing a kangaroo in the wild? On the way to Mt. Tamborine, Wayne spotted a wallaby -- a small kangaroo -- at the fringe of the road. It cooperated just long enough to stay in sight for the rest of us, after we u-turned to check it out. We selected Mt. 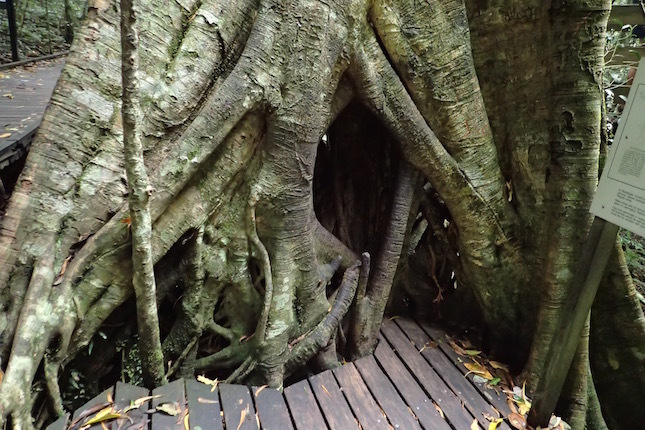 Tamborine's Cedar Creek trail, a short hike with a pleasant series of waterfalls. After all the hustle and bustle tourism of Gold Coast, it was nice to stop at a spot that was clearly a local hang-out. There's a real sweetness to watching families cool off together on a hot afternoon, swimming in pools by the falls. We much prefer that to the mega-bucks family attractions in Gold Coast, through they have their place. 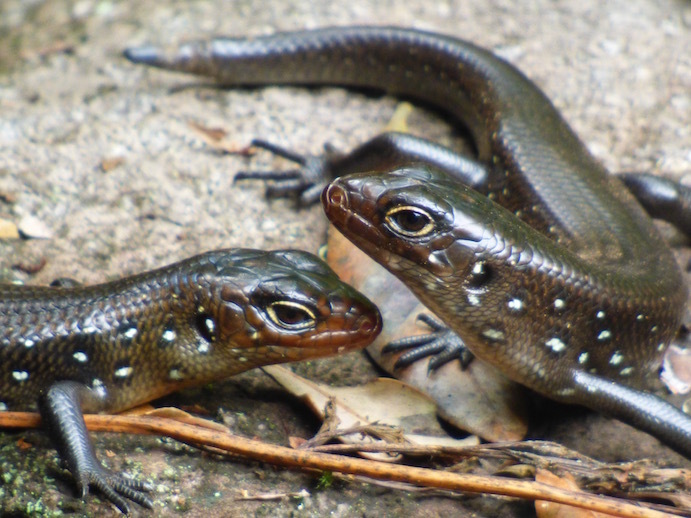 Baby skinks in the wild (viewed through a 60x zoom) of Mountain Garden, Lamington Natl. Park, QLD, Australia. As sunset approached, we ended our drive by cruising the biggest Gold Coast attraction of all... it's nearly endless beaches. Our take-away.... The Hinterlands is far more than a middle-of-no-where reference. It's a real place, worth far more time than the one-day blitz we gave it. 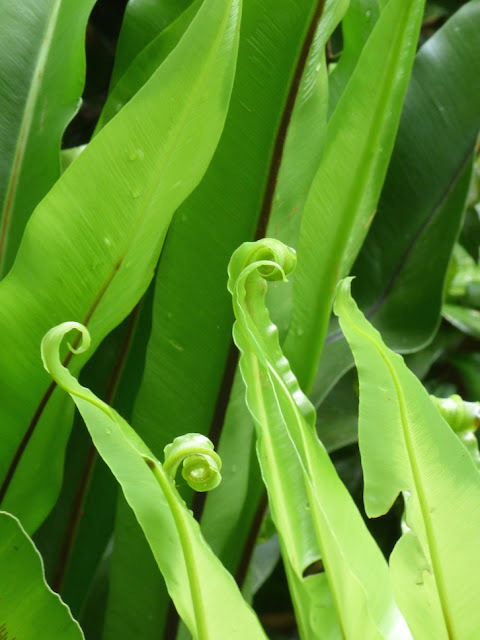 In an ideal world, visit it for a week or so, camping and hiking and immersing yourself in its exotic tapestry of birdsong and fecund jungle. It takes time to appreciate the wonders spread out across it's one-of-a-kind terrain. Still, we're grateful we got to see what we did of the Hinterlands. 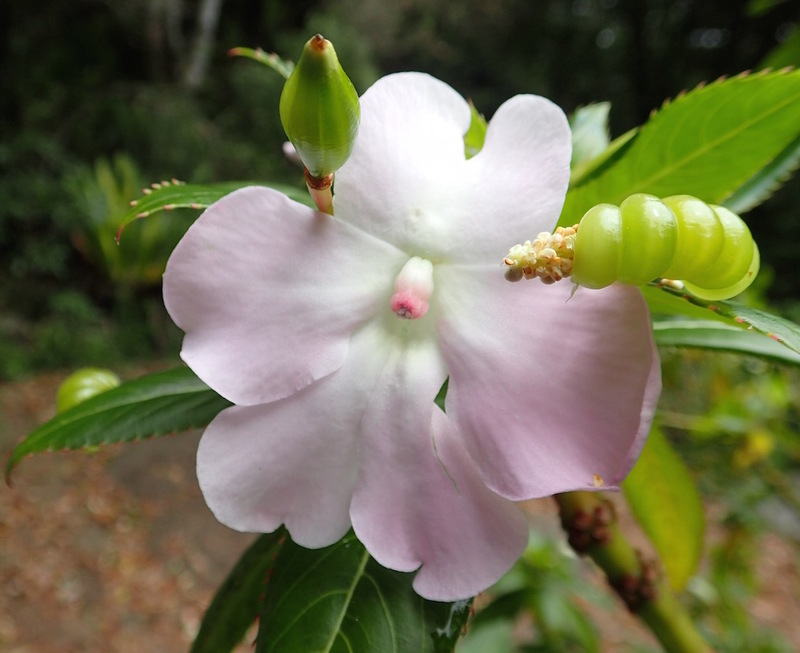 One among the many blooms at Lamington National Park's Mountain Gardens. LQD Australia. Considering how much we enjoyed the Hinterlands, guess that means Timbuktu is on our bucket list. Then again, we've no plans to visit Africa, which as it currently stands, is unlikely to fit our paltry travel budget. 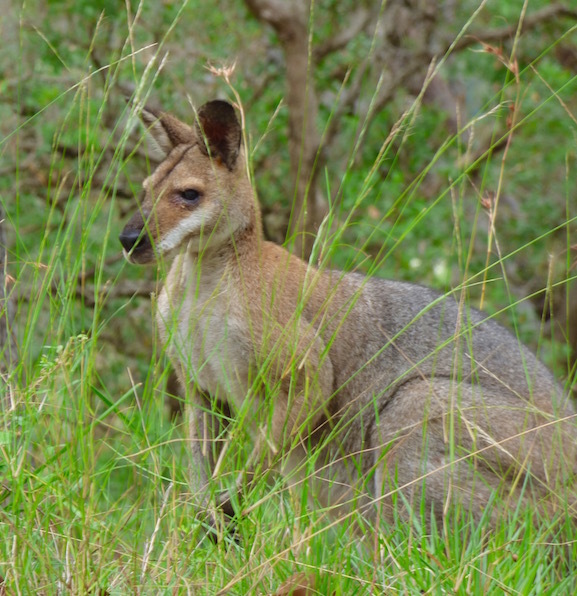 Wallaby - a smaller member of the kangaroo family, Seen in the wilds of Australia's Hinterlands. This is a recent retrospective of our time, December 5-11, 2016 in Marine Stadium (aka "Bum's Bay"), Gold Coast, Queensland Australia (S27.56.790 E153.25.424). We're in Pittwater, New South Wales, Australia (S33.39.433 E151.18.051), an hour's drive and four hour's sail from Sydney -- or so we're told. 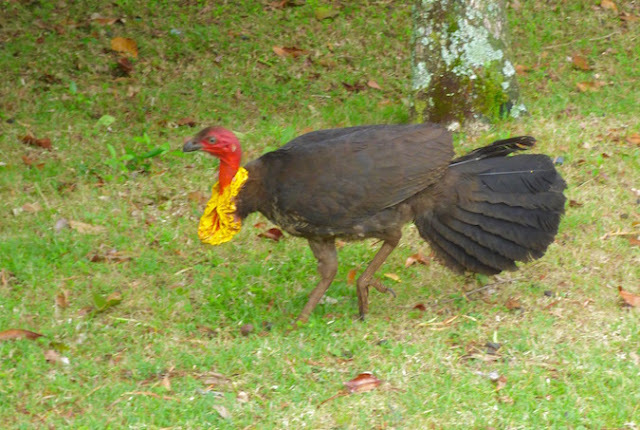 No wonder turkey isn't as popular in Australia! These wild ones run rampant in Queensland. We've seen better-looking vultures. This fella didn't read the "Don't feed the birds" sign. We did, and obeyed. Lamington Natl. Park. QLD, Oz.